Thanks to the popularity of GoPro’s tiny, versatile action cameras, basically every manufacturer out there has waded into the rocky waters of adventure video shooters. Nikon’s just the latest, and while its offerings look a little familiar, they’ve got some weirdness about them as well. 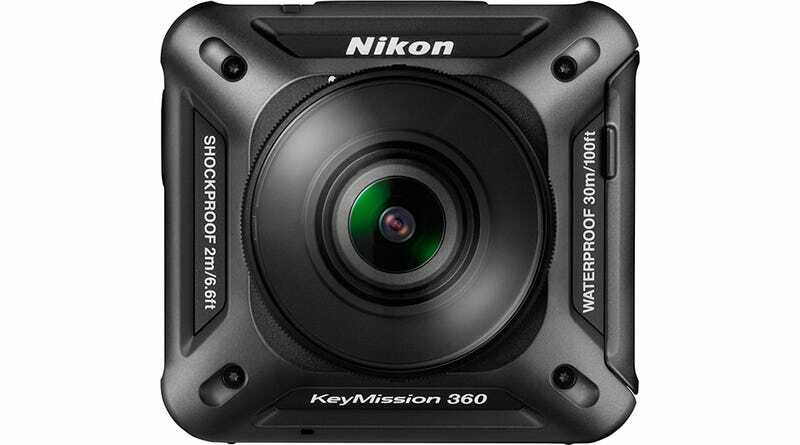 Back in January, Nikon gave us a first look at the KeyMission 360, the manufacturer’s first proper action camera. The company was thin on the details. Today, we’re getting the full shebang, along with two other KeyMission cameras that’ll be hitting stores this fall. In addition to the KeyMission 360, the company is also introducing a KeyMission 170, and KeyMission 80 models. The numbers, in case it’s not obvious, correspond to the approximate field -of-view of each camera. They’re all dressed up in snazzy black casing that’s rugged to the touch and meant to be tossed around. The $500 KeyMission 360 joins the increasing number of cameras available for shooting 360 degree video. This video format is becoming increasingly popular and useful as both Facebook and YouTube support it. The blocky 360 uses two cameras with their own sensors and lenses to capture a full 360 viewable scene. All of the video stitching is done in the camera. One of the nice features here is that the the 360 is waterproof without any housing or casing. It’s good for 98 feet underwater and a 6.6-foot drop to concrete straight out of the box. It shoots 4K video at up to 24p (or just FullHD, if you want to save some storage space). The $400 KeyMission 170, for its part, is the most obvious GoPro clone of the bunch, down to its tiny rectangular shape. Like the 360, it shoots 4K video, and it’s also waterproof (33 feet) and shockproof (6.6 feet). Finally, the $280 KeyMission 80 is Nikon’s slim, tiny take on a life-logging camera. It’s about the size of a very small smartphone, and shoots video in only one direction. It’s waterproof (3.2 feet) and shockproof (6 feet). as well, but you definitely don’t want to abuse the 80 as much as its big brothers. Though smartphones have adopted much of the work one-way cameras like the Flip used to do, there’s still something of an argument to be made for a standalone camera to shoot one-way video—especially in rugged or raucous situations (protests! concerts!) where you really really don’t want to drop and destroy your $1000 smartphone. All of the cameras come with some mounting equipment, and Nikon plans to introduce a slew of new accessories to help you run, jump, bike, swim, dive, fall, tumble, and hurt yourself while using these cameras. The sticking point straight from the outset on these shooters is price. They cost more than the comparable competition in each category, without adding any obviously better features. In part, Nikon is betting people will bank on the company’s pedigree and pay a little more. And there’s some logic to this. The sensor technology is certainly similar to what we’ve seen in Nikon compacts before. But companies like GoPro have had enough success that the Nikon name alone won’t be enough to sell the cameras. Are they good enough? We’ll know when they’re available next month.